Dhaka, September 24: “An unforgettable evening of 27th August 2017, left the scars over memories of those 532 Hindu Rohingyas, whose male family members were beaten and slaughtered in front of their eyes by the Muslim Rohingya goons”. Yes, the Human Rights organizations, Muslim bodies, the UNHRC and many more are talking for the Muslim Rohingyas who have systematically heavily infiltrated in various parts of India capturing lad and properties there, but a small and real minority segment of Hindu Rohingyas are fleeing to escape from barbaric attacks by the Muslim Rohingyas depicting their real face. 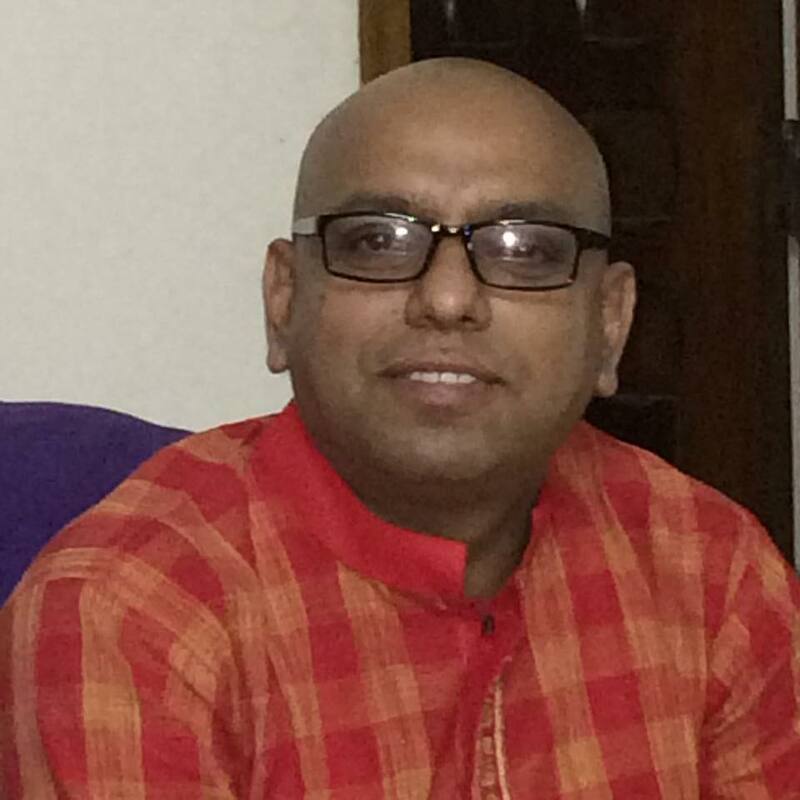 Prof. Chandan Kumar Sarkar, the Human Rights champion of Bangladesh and head of Research and Empowerment Organization based in Dhaka, has published a fact-finding report on the unseen and neglected plight of the Hindu Rohingyas who are migrating from Myanmar to Bangladesh after facing brutal attacks by the Rohingya Muslim goons who killed the male Hindu members and are forcing Hindu females to marry them and convert to Islam. In the Evening 27th, August 2017, a group of Muslim goons covered Black Masks come and blockade the Hindu village at Fakirabazaar in Myanmar. They search door to doors took men’s and bring into a place, 1st beaten mercilessly them after that slaughtered them by sharp weapons with a slogan. Anika Dhar a resident of Chikarjuri, Hindu area in Fakirbazaar, Myanmar- said “I lost my husband; the Black mask covered people slaughtered my husband in front of me. 24 days have gone but I didn’t do anything for the ritual funeral for my husband even I am pregnant for six months who will give me shelter as well my children”- She is crying. The children and young girls are affected much. Orphaned Kishore Kumar, Tarpan Shil, Palash Shil are rescued two days back from different camps at Kutupalong. 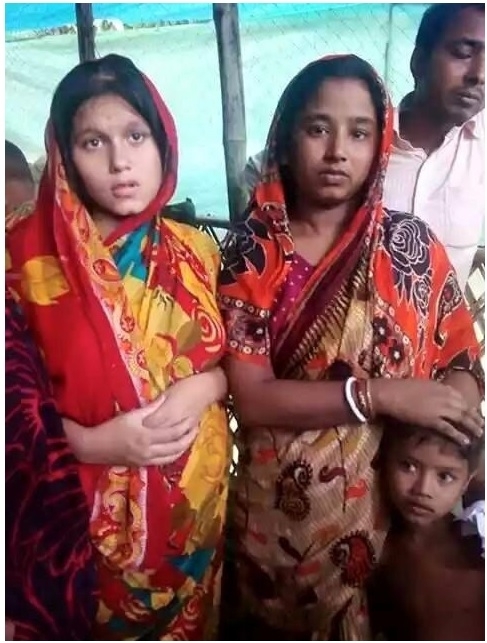 The young Hindu girls also rescued from Muslim camps with the help of local Hindu people. However, 9 Hindu girls have been raped in Bangladesh by the Muslims even army men do not behave well of the Hindus Rohingya. Even few Islamic groups are working and trying to convert Hindu Rohingya to Islam. There are 532 Rohingya Hindus maxima are female and children, their family men members had been slaughtered. They took shelter in the chicken farm at near Kutupalong Rohingya Camp at Ukhiya, Cox's Bazaar in Bangladesh. A local Hindu man Jogodish Saha gave shelter to the Hindu Rohingya in his Poultry farm. Research and Empowerment Organization is working for Hindu Rohingya. REO is giving food and medical facilities for them. However, REO is working with local people, where they stayed three days with 4 doctors and 19 volunteers to serve the Hindu Rohingya. REO and local people served 1000 people per day for medical facilities and feeding including Muslims Rohingya. Marginalized Hindu Rohingyas are deprived in every aspect in Bangladesh. Even they are not getting relief from government side due to Hindu, this is religious discrimination is going on. 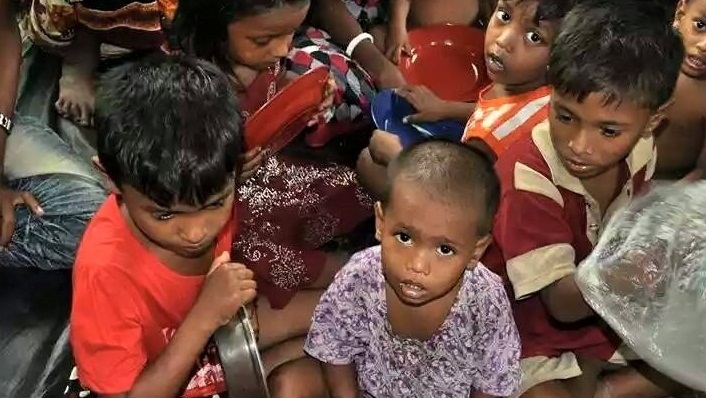 The government allocated 2000 acres land to the Rohingya people but Hindus are excluded. Even, few local newspapers had published that local MP and local leaders told Hindu Rohingya left to India because India is for Hindus. However, Islamic few People visited with relief to Hindu Rohingya people but while they are giving to relief to the Hindu Rohingya, they are inviting them to convert to Islam. A local Jogodish Saha gave their own farmhouse to stay, even they are feeding to the Hindu Rohingya but they are not able to do for long-term. They are arguing to Research and Empowerment Organization-REO to do help for feeding and long-term solution for Hindu Rohingya. There are 532 people, even two times meals also very expensive. REO argues to the world people please raise the voice as well as please raise your hands to do something for these Hindu Rohingya people not only for the short but also for the long-term solution, unless very soon these people may be converted to the Islam or will die soon.